You are currently browsing the daily archive for March 12, 2008. What does the success of several Japanese baseball players in America’s Major League Baseball (for instance, Ichiro Suzuki, only major leaguer to have 200 hits or more in his each of his first seven seasons) have to do with innovation? According to the International Herald Tribune (Monday March 10, p. 17), the answer is: a combination of a creative master coach, American Lou Piniella (former Yankees star and now a manager), and the discipline of Japan’s culture, expressed in its hitting stars. Japanese batters in America, along with Piniella, have developed an innovative hitting style. They stand closer to the plate, and instead of stepping toward the pitcher when swinging the bat, they step toward first base (when hitting to right field), or toward third base (when hitting to left). In this way, they can hit the ball wherever they wish, almost. This hitting style requires many many hours of practice, and great discipline. The Japanese players have it. It is part of their culture. Together with the innovator who developed the approach, creativity and discipline make a winning combination. Recently Kosuke Fukudome has followed in Suzuki’s footsteps. 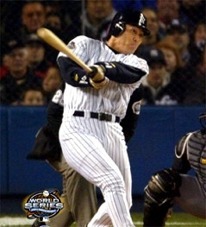 So has the Yankees’ great hitter Hideki Matsui.